Welcome to the Twelfth and final day of our journey through some of the best bits of the inaugural Southwell Music Festival. We hope you have enjoyed the ride and will be encouraged to join us in August 2015. Our thanks to all our wonderful musicians for their inspiring performances, to all those who contributed so generously both financially and in kind, and to all our venues but especially to the Dean and Chapter of Southwell for the use of the State Chamber and of course the Minster itself, without which our Festival would not have happened. For our final extract we return to The Creation performed in the Minster on Saturday 23 August and offer the final chorus of this enduring masterpiece. 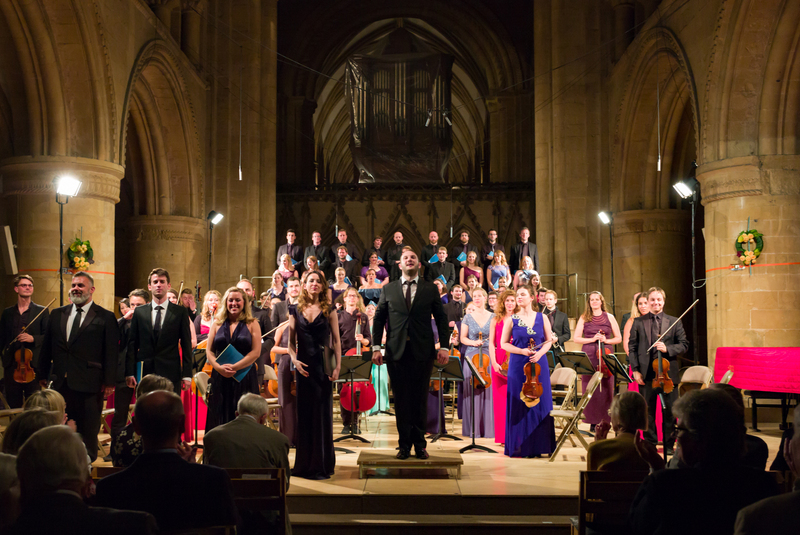 The performers were Sophie Bevan (soprano), Andrew Staples (tenor) and Ashley Riches (bass) with the Southwell Festival Voices and Southwell Festival Sinfonia conducted by Marcus Farnsworth. The recording producer throughout the series has been Alex Barnes . If you would like to comment on our 12 Days of Christmas celebration or on the Southwell Music Festival in general please email or join the conversation on Twitter. Please join us for the Festival’s London concert on Tuesday 3rd February and find out about the 2015 Festival programme when it is launched at Southwell Minster on Friday 13th March. Details are in the Christmas newsletter (pdf download). The dates for the 2015 Southwell Music Festival are 27-31 August. Welcome to Day Eleven of our 12 Days of Christmas series in which we are presenting twelve short highlights from the inaugural 2014 Southwell Music Festival. Our Sunday night concert in the State Chamber (24th August) entitled To Those Who Died commemorated the start of the First World War with music written at the time or inspired by the experience of war. Today’s highlight is Ivor Gurney’s song Sleep sung by the Festival’s Founder and Artistic Director Marcus Farnsworth accompanied by Libby Burgess. The recording is by Alex Barnes .. Welcome to Day Ten of our 12 Days of Christmas series in which we are presenting twelve short highlights from the inaugural 2014 Southwell Music Festival. We wanted a big musical gesture to open our first Festival and in chamber music terms there are few bigger than Mendelssohn’s Octet – indeed the 16 year old composer directs that the players should perform in an orchestral manner. So here are the opening moments of that performance – the first of two by these players on the evening of Friday 22 August as they went on to repeat it in the Old Theatre Deli an hour or so later: a landmark in the performing history of this great piece. The performers are Jamie Campbell, Hannah Dawson, Natalie Klouda and Maria Włoszczowska (violins), Ruth Gibson and Simon Tandree (violas), and Karel Bredenhorst and Nathaniel Boyd (cellos). The recording is by Alex Barnes . Welcome to Day Nine of our 12 Days of Christmas series in which we are presenting twelve short highlights from the inaugural 2014 Southwell Music Festival. Our Sunday night concert in the State Chamber (24th August) entitled To Those Who Died commemorated the start of the First World War with music written at the time or inspired by the experience of war. Today’s highlight is the conclusion of Elgar’s Piano Quintet. The instrumental ensemble comprised Jamie Campbell and Maria Włoszczowska (violins), Simon Tandree (viola), Nathaniel Boyd (cello) and James Baillieu (piano). The recording is by Alex Barnes . One audience member commented on the overall quality of chamber concerts: “Some of the best chamber performances I’ve ever heard – I speak as an experienced classical recording engineer. Wonderfully varied programmes, avoiding some of the ‘usual suspects’. The plan for the Southwell Music Festival has always been to present a fringe programme as a platform for local musicians, and especially young performers, alongside the more formal concerts by our 50 or so visiting singers and players. Today’s compilation shows the range of our first fringe programme – encompassing Jiallo performing jazz, funk and hip-hop in the Old Theatre Deli; a vocal concert at the Methodist Church including three former Minster head choristers – the Minstery of Sound – performing renaissance polyphony, followed by the East Midlands Youth Voices; then, from a concert revealing the highways and byways of horn playing, probably the first (and last?) appearance of a plastic telescopic alphorn in Southwell dueting with a natural horn; then former string players from the Nottingham Youth Orchestra performing in the Walled Garden of the Archbishop’s Palace; and finally harpist Roisin Hickey in the State Chamber. The recording is by Alex Barnes . Welcome to 2015 and to the seventh instalment of the Southwell Micro Midwinter Music Festival Online – 12 highlights from the 2014 Festival for the 12 Days of Christmas. For those who attended the inaugural Festival back in August we trust this is proving an enjoyable feast of musical reminiscence; for newcomers we hope these tasty morsels will encourage you to attend the second Festival between 27 and 31 August 2015. With fresh beginnings in mind our first extract of the New Year comes from The Creation – the performance of Haydn’s masterpiece in the Minster on Saturday 23rd August was at the heart of our inaugural Festival. 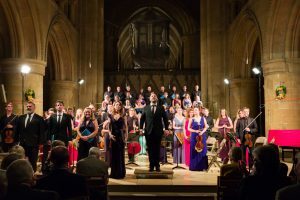 The performers were Sophie Bevan (soprano), Andrew Staples (tenor) and Ashley Riches (bass) with the Southwell Festival Voices and Southwell Festival Sinfonia conducted by Marcus Farnsworth. The recording is by Alex Barnes . the heav’n and earth are stor’d. https://www.southwellmusicfestival.com/wp-content/uploads/2015/01/smf_day7.jpg 395 700 Cheyney Kent https://www.southwellmusicfestival.com/wp-content/uploads/2016/08/southwell_music_avatar-295x300.jpg Cheyney Kent2015-01-01 10:00:212015-12-20 05:50:57Happy New Year! Welcome to Day Six of our 12 Days of Christmas series in which we are presenting twelve short highlights from the inaugural 2014 Southwell Music Festival. One of the aims of the Festival is to provide a platform for local, and especially young, musicians. At our first Festival there was no better example of this than the appearance of the 11 year old pianist Jeneba Kanneh-Mason. As winner of Nottingham Young Musician of the Year 2013 Jeneba was offered a concert in the Festival: this extract from the Schubert Impromptu D899 no. 3 was part of this, her first full length recital. The hour-long programme, given in the State Chamber on Saturday 23rd August 2014, also included Mozart, Liszt, Chopin and Moszkowski. The recording producer was Alex Barnes . One audience member described Jeneba’s performance as “awe-inspiring”. If you would like to comment on our 12 Days of Christmas celebration or on the Southwell Music Festival in general please email or join the conversation on Twitter. Welcome to Day Five of our 12 Days of Christmas series in which we are presenting twelve short highlights from the inaugural 2014 Southwell Music Festival. Today we offer two songs from Brahms’ Liebeslieder Walzer Op 52. The complete performance of the cycle closed our opening Chamber Classics concert in the State Chamber on Friday 22nd August. 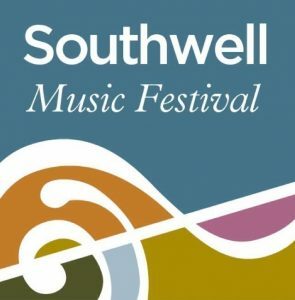 The concert – showcasing the talents of a core group of Festival musicians, the Southwell Festival Chamber Soloists – began with Mendelssohn’s Octet, followed by Mozart’s Quintet for Piano and Winds. The songs chosen are nos 11 (Nein, es ist nicht auszukommen) and 12 (Schlosser auf, und mache Schlösser). No, it is not possible/To put up with these people;/They interpret everything/So spitefully. If I’m happy, they say/I harbour lewd desires;/If I’m quiet, they say/I’m madly in love. Locksmiths, come, make me padlocks,/Padlocks without number!/So that I can shut their malicious mouths/Once and for all. The performers are Alison Rose (soprano), Carris Jones (mezzo soprano), Nick Pritchard (tenor) and William Townend (bass) with pianists James Baillieu and Libby Burgess. The recording producer is Alex Barnes . Welcome to Day Four of our 12 Days of Christmas series in which we are presenting twelve short highlights from the inaugural 2014 Southwell Music Festival. The recording producer for our series is Alex Barnes who, with camera man Matthew Dove, recorded nearly every moment of the Festival. Alex is also a professional cellist and found time to perform – as here in his own arrangement of Appalachia Waltz by the American fiddler, composer and music teacher Mark O’Connor. The violinist is Anna Croad. More than half the events in the 2014 Festival were free and this performance was one of those events – part of Southwell Minster’s regular ‘Lunchtime in the Cathedral’ series. Welcome to Day Three of our 12 Days of Christmas series in which we are presenting twelve short highlights from the inaugural 2014 Southwell Music Festival. Our Sunday night concert in the State Chamber (24th August) entitled To Those Who Died commemorated the start of the First World War with music written at the time or inspired by the experience of war. We have chosen ‘From far, from eve and morning’ from Vaughan Williams On Wenlock Edge – six settings of poems by A.E.Housman. The singer is tenor Andrew Staples who was also the tenor soloist in Haydn’s The Creation and supplied an atmospheric photographic record of the Festival. The instrumental ensemble comprised Hannah Dawson and Natalie Klouda (violins), Ruth Nelson (viola), Karel Bredenhorst (cello) and Libby Burgess (piano). The recording producer is Alex Barnes . Sunday Times music critic Hugh Canning was present and tweeted that the State Chamber was “perfect for chamber music and song” – an opinion long held locally and now, happily, shared with the world.